complexities in the upward swing. Players who want to improve their serves have to understand these options, and consider them in the context of their physical capabilities. Now, in the next two articles, let's take the same approach and explore the options in our investigation of the upward swing. We'll start in this article by seeing how the conditions of the trunk are critical for setting up certain elements of the upward motion. As in the previous articles, we'll use 3D data for a high level junior player to provide examples of how the various segments interact. Developmental coaches should take special note of this data, as this junior exhibits issues that are almost universal in the development of the serve. My belief is that these issues should be addressed in coaching as early as possible. We've already seen that defining the options in the motion becomes more difficult as the speed of the motion increases, for example, when we moved from the windup to the backswing. When we try to analyze the upward path of the arm and racket this difficulty becomes even greater. 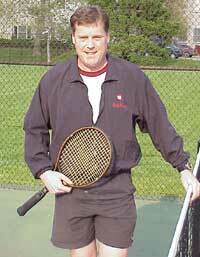 Brian Gordon is the creator of Gordon Applied Motion Analysis and 3D Tennis Technologies. Currently, he is finishing his Ph.D. in Sport Biomechanics at Indiana University. Some of his initial quantitative research on the biomechanics of the serve has been published in a leading academic journal. But Brian's life long passion for tennis also extends beyond the academic to the applied level. A USPTA teaching pro and coach with 15 years of experience, Brian has developed revolutionary quantitative training methods for use by working coaches and players. Based in Cincinnati, Ohio, 3D Tennis Technologies (www.gamasports.com) offers the only quantitative sports biomechanics analysis package currently available in tennis. Brian is always interested in speaking with individuals or groups committed to advancing player development methodology and the understanding of tennis stroke mechanics. He can be contacted directly at bgordon@gamasports.com.